3 page scedule for Woman's Relief Corps, No. 98, Auxiliary to Post No. 164, Grand Army of the Republic, Meetings 1888. Lists officers and committee members. Woman's Relief Corps, No. 98, Conway, Mass. H. E. Miller, Cummington, Mass. Woman's Relief Corps, No. 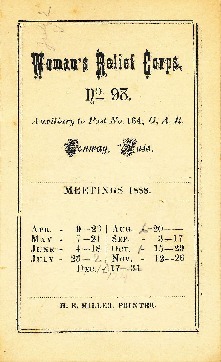 98, Conway, Mass., “Woman's Relief Corps Schedule of Meetings,” Conway Historical Society, accessed April 21, 2019, http://conwaymasshistory.org/items/show/449.